Keep reading for the recipe and directions to make Week 1, Meal 3: Grilled herb chicken with sauteed spinach over wild rice and chicken sausage stuffing. Start the rice first because that’s what will take the longest to cook. 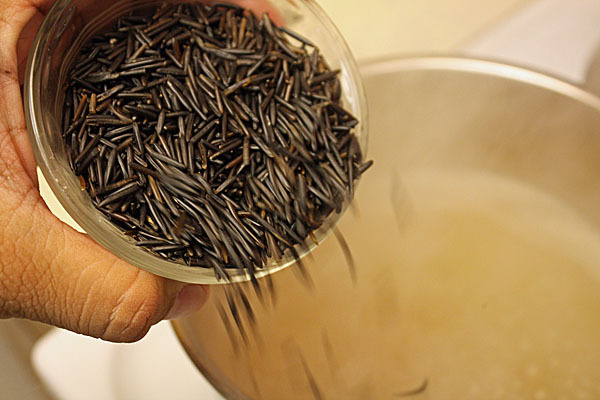 Boil 1 1/2 cups of chicken stock and toss in 3/4 cup of wild rice. Give it a little stir and once the rice comes to a boil again, drop a cover on the pot, turn the heat to low and let it simmer for 45 minutes to one hour, depending on your preference. Check the directions on your rice though. Mine called for a 4-to-1 ratio of liquid to rice instead of the more common 2-to-1. So I used the same amount of chicken stock and added water in for the rest to keep it healthy. Mine took closer to 45 minutes until the pieces broke open and were chewy-but-fluffy in the mouth. 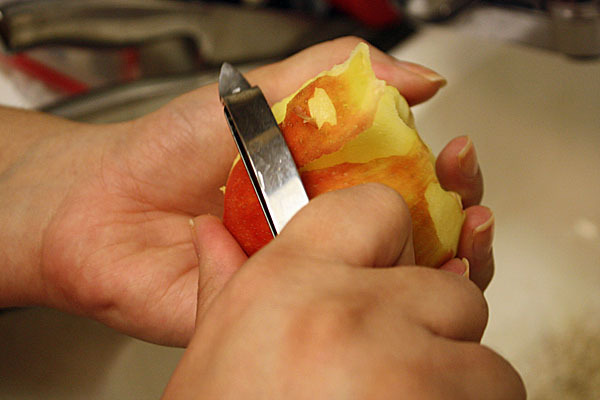 Once the rice is on, you can quickly peel the apple and then cut up both 1 apple and 1 onion into a small dice. Mince 2 cloves of garlic and put in a bowl with the onions. 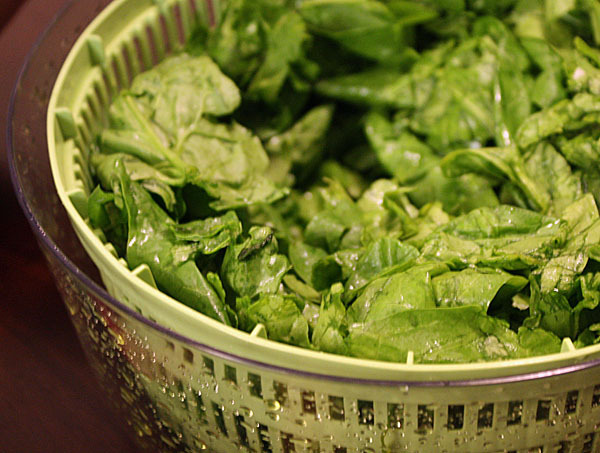 Head back to the sink and wash and dry your spinach in a salad spinner. Heat a pan on medium and toast 1 t of fennel seed. You’ll know it’s done because it will become very fragrant and appear golden brown. 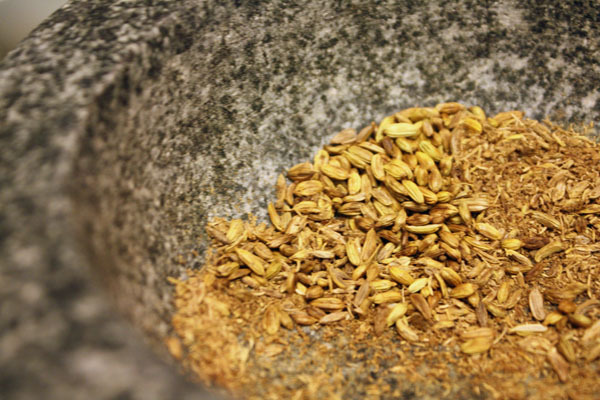 Move the seeds into a mortar and pestle and grind into a powder. My almonds weren’t roasted so I used the same pan that I did the fennel in to brown 1/4 cup of almonds. As a final step before putting together the wild rice, chop up 2 T of flat-leaf parsley. Your rice should be close to finished, and once it is, strain it and keep on the side. After doing this, preheat your grill to medium-high for the chicken breast. In a high-rimmed sauce pot over medium-high heat, use 1 T of olive oil to soften the onions and garlic in the oil. Remove 1 sausage from its casing by running your knife down the link. You should be able to easily separate the casing from the meat. 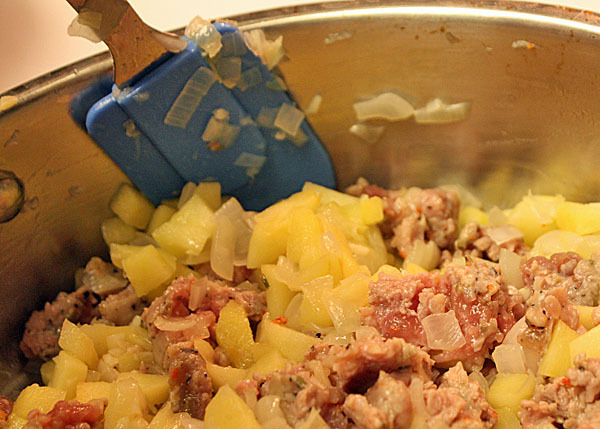 Add apple pieces and cook with the sausage, breaking up the meat into marble-size pieces with your spatula. Add fennel seed and mix well. 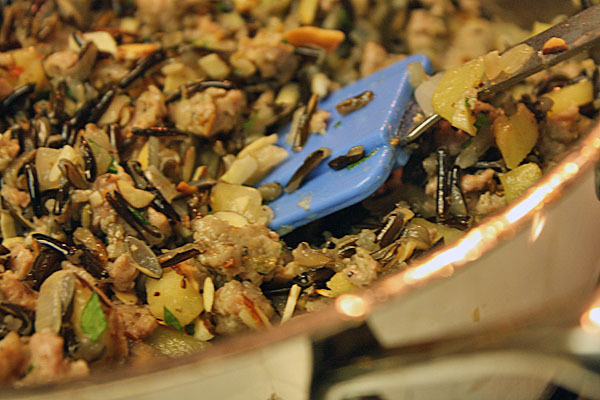 Once the sausage is almost cooked (about 5-8 min), add the wild rice and reduce the heat. 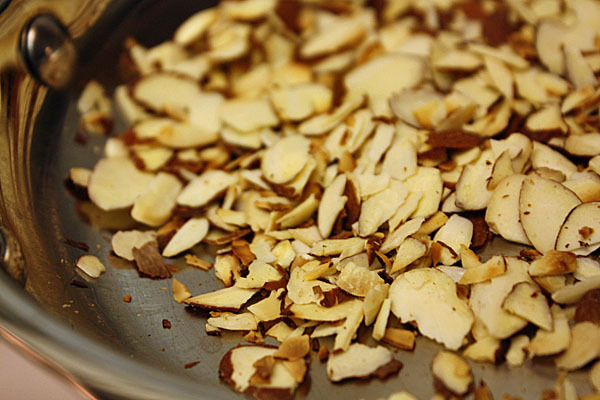 Add parsley, almonds, salt and pepper and turn heat to low. 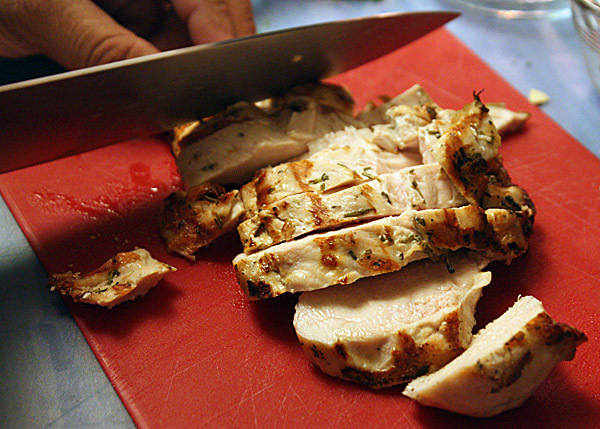 Your grill should be preheated by now, so all you have to do is cook the chicken breast about 8-10 minutes per side. Give it a 45-degree turn about halfway through on each side to get some beautiful grill marks. Once you’re done grilling, let the chicken rest for about 5 minutes. While the chicken is resting, heat a sauce pan to medium-high and quickly cook down 8 oz. of baby spinach with 2 T of water. 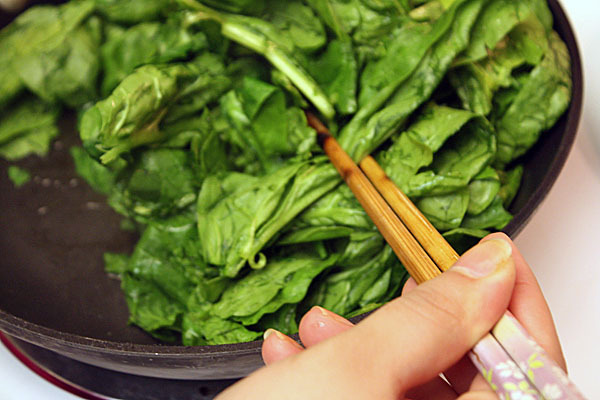 Season the spinach with salt and pepper and you’re ready to plate! Scoop 3/4 cup of your wild rice mixture and top with half of the spinach portion. 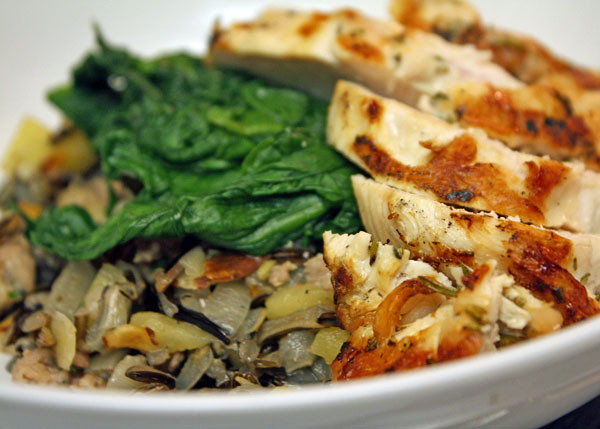 Slice the chicken breast and plate on top of the spinach and wild rice. Then you’re ready to dig in. This dish had so many flavors going off at once — sharp fennel seed, sweet apple, savory chicken and sausage — and the hearty wild rice with sausage could really be a meal on its own. Especially as the holidays arrive, this is one I’m keeping on the short list. Previous PostWeek 1, Meal 2: Grilled herb chicken panini with apple butter, caramelized onion and gruyereNext PostWhere should I eat on free day? This dish made me fall in love with wild rice, as I have never had it before. Who would ever think to mix juicy grilled chicken with the sausage? They were a PERFECT combo with the almonds too! Thank you for dinner Niyaz! It was a treat that delightfully came from your kitchen and not a fancy restaurant. Dude, regular rice is a grass also. Actually, from what I can tell, rice is a grain and wild rice is a grass. Anyone else know more? Man..all your dishes look awesome…how is your exercise routine going? I hope you’re not doing some crazy Swiss ball routines, etc or doing lunges/squats already…I’ve seen some crazy stuff that trainers do to noobs etc. porkchop: yo yo. exercise actually isn’t anything strenuous. Just trying to get 30 to 60 minutes of walking in per day. going to be doing it today after dinner. Glad to hear you’re not stressing on the working out. I have roommates that have gone turbo healthy and won’t even eat a regular meal anymore. It’s annoying as hell. They feel the need to work out every time I cook. Everything in moderation dude!